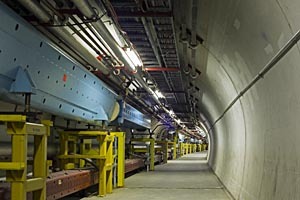 Scientists conduct basic research into the smallest building blocks of matter at the Fermi National Accelerator Laboratory (Fermilab), west of Chicago. One experiment shoots an intense beam of neutrinos at nearly the speed of light 450 miles through the earth to the Soudan mine in northern Minnesota. Elsewhere, the New Muon Lab is testing superconducting radio-frequency cavities, a key technology for the next generation of particle accelerators.